Producer-Driector Divya Khosla Kumar was seen along with her husband Bhushan Kumar during the IIFA Awards 2016 on the green carpet wearing a Golden Lehenga Blouse Saree designed by Vikram Phadnis. She looked pretty with Gold necklace and big earrings with a black bindi on her forehaed. Shamita Shetty wearing a sleeveless blue peplum top dress with golden zari work floral design embroidery with a matching Palazzo pants. Floral emroidery was highlighted on the dress which was designed by Vikram Phadni’s. Shamity Shetty was wearing this beautiful outfit at Vikram Phadni’s 25th anniversary fashion show in Mumbai. Juhi Chawla wearing a bright red Churidar Salwar kameez embellished with golden zari embroidery across the neck and wide embroidery just before the hem of the kameez following a golden border. She teamed it with a matching dupatta with zari border. She wore this beautiful outfit designed by Vikram Phadni’s during his 25th anniversary and looked awesome. 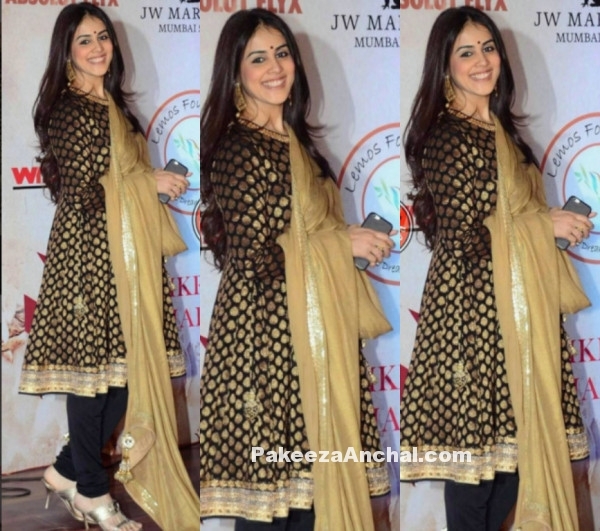 Genelia D’souza was seen with Ritesh Deshmukh wearing Black Gold Vikram Phadni’s suit during Vikram Phadni’s 25th Anniversary celebrations. Black and Gold Salwar Kameez gave a perfect ethnic look for the evening. She [aired it with a Gold shade dupatta to accentuate the dress. Malaika Arora Khan wearing a traditional Gold lace Saree with floral embroidery over the Red border of the Saree during the Blenders Pride Fashion Tour. Paired it with a Black short sleeved Sequin Blouse with a teasing neckline and cap sleeves with embroidery over the sleeves makes her look stunning. Malaika Arora Khan walks on the ramp wearing a fabulous sea green Lehenga Saree embellished with embroidery work motifs and gold zari work across the border and patch work on Saree. Hem of the Saree had a wide Gold border. She paired it with a sleeveless Gold color blouse with deep back and big earrings while walking on the ramp with Vikram Phadnis. Karishma Kapoor wearing Vikram Phadnis designer Gold Ball-Gown Skirt embellished with Sequins and stones on the top half of the Gown. She was decked out in a the flared ball-gown skirt with long trail shining with actual particles of gold. Karishma Kapoor was the show stopper in Vikram Phadni’s gown composed of lace and a bling golden fabric.